The following Christian outreach support groups, although inspired by Umbrella Ministries, are independently set up and operated locally by women of faith. Meeting 4th Thursday of each month • Visit our Facebook Group! Stay up to date on Conference dates and read inspiring articles from moms across the country. 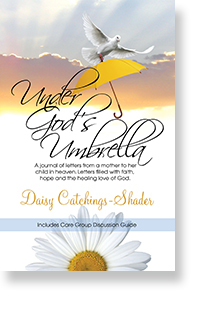 A journal of letters from a mother to her child in Heaven, filled with faith, hope and the healing love of God. There will be no sorrow, no sickness, and no heartaches. There will be gladness and light and joy forever. Have you ever asked the following questions? Is Heaven a real place? What is Heaven like? Does the Christian go immediately to Heaven? Will we know our loved ones in Heaven? If you are unable to send a donation for the above books, and wish to receive them, Umbrella Ministries will send them to you free of charge. Seminars and support groups for people grieving the death of a family member or friend, led by people who understand what you are going through and want to help. Click Here for additional information or to find a Grief Share group in your area.